Award Year: 2006 New drugs for depression, anxiety, schizophrenia, and bipolar disorder have been introduced over the past 20 years, leading to better treatment options for patients and improved management of common mental illnesses. But the wide adoption of these drugs has also created rising public expenditures and large profits for the pharmaceutical industry. Many public and private payers, as well as policymakers, question whether the newer drugs are worth their costs, or whether we are paying higher prices for "me-too drugs," reformulations, and expensive marketing and promotion campaigns to increase sales. Haiden A. Huskamp, Ph.D. contends that the key question in assessing the value of newer psychotropic drugs is how the social costs compare with the social benefits. Her project, Has the Revolution Come and Gone? The Societal Value of New Psychotropic Drugs, attempts to answer this question through a broad range of analyses that look at the benefits of the newer drugs versus older ones, how effective the newer drugs are when used in practice, and how factors like marketing and pharmacy management affect their use. Huskamp's findings will identify policy levers that could help increase the value of U.S. psychiatric drug spending. Haiden Huskamp is a professor of health economics in the department of health care policy at Harvard Medical School. Her research is focused in three primary areas: 1) the economics of the pharmaceutical industry; 2) the economics of mental health and substance abuse treatment; and 3) the financing of end-of-life care services. Dr. Huskamp has developed a body of research on the impact of pharmacy management tools on drug utilization, cost, and quality of care. Through a Career Development Award from the National Institute of Mental Health, she has examined the impact of formularies on cost and utilization patterns for prescription drugs used to treat mental illness; the effect of generic entry on drug sales, market share, and the advertising and promotional strategies of drug manufacturers; and the implications of the Medicare Part D drug benefit for access to psychotropic medications, pricing, and incentives for future innovation. 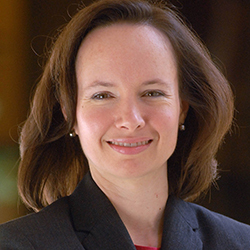 Dr. Huskamp's recent work on end-of-life care financing includes a study of patient-level variation in hospice costs and research on factors that influence the decision to use hospice care among terminally ill cancer patients. She received a Ph.D. in health policy with a concentration in economics from Harvard in 1997 and a B.A. in public policy from Duke in 1989. McWilliams, J.C., Zaslavsky, A.M., Huskamp, H.A. Implementation of Medicare Part D and Non-drug Medical Spending for Elderly Adults with Limited Prior Drug Coverage. JAMA, 2011, 306(4): 402-409. Barry, C., Huskamp, H. Moving beyond Parity-Mental Health and Addiction Care under the ACA. NEJM, Sep 15 2011, 365(11): 973-975. Huskamp, H.A., Busch, A.B., Domino, M.E., Normand, S. Antidepressant Reformulations: Who Uses Them, and What are the Benefits? Health Affairs, May / June 2009, 28(3): 734-45. Donohue, J.M., Huskamp, H.A., Zuvekas, S.H. Dual Eligibles With Mental Disorders and Medicare Part D: How Are They Faring? Health Affairs, May / June 2009, 28(3): 746-59. Busch, A.B., Huskamp, H.A., Neelon, B., Manning, T., Normand, S.T., McGuire, T.G. Longitudinal Racial/Ethnic Disparities in Antimanic Medication Prescribing for Bipolar-I Disorder. Medical Care, 2009, 47(12): 1217-1228.